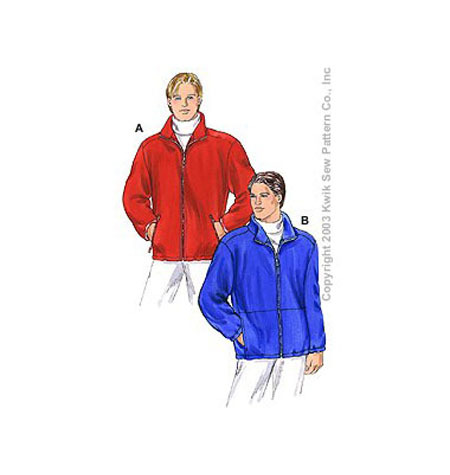 Men's jacket has stand-up collar, forward shoulder seams, front zipper and elastic drawstring at bottom edge. View A has zipper pockets and sleeves finished with bindings from swimwear fabric. View B has pockets in side seams and elastic in casing at bottom of sleeves. Designed for heavy stretch knits only, such as Polarfleece, heavy flece, blanket fleece. Lining for pockets: light to medium weight woven fabric.